Resistance bands are the easiest, safest and most convenient way to increase your strength. They are incredibly effective, whether you're doing physical therapy or just trying to get stronger. They are also incredibly light and take up almost no space, so you can carry them with you anywhere. The variety of exercises that you can do with resistance bands is staggering. You can do warm up exercises, muscle resistance exercises, plyometric exercises and even cardio. Almost every single exercise you do will improve your core muscle stability and mobility. 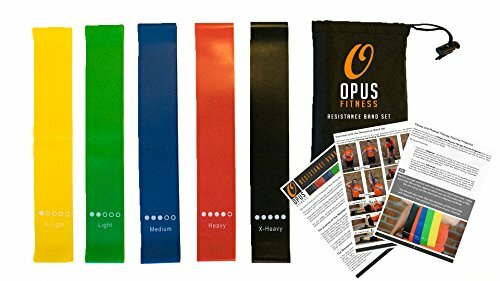 Resistance bands are highly effective, but they are also very kind to the joints. They don't put pressure on the joints in the same way as free weights, for example. They also incorporate multiple muscles in every exercise. These two factors make them absolutely ideal for injury rehabilitation. They'll gradually strengthen your injured muscles or joints without straining or pulling them. Inside the package you'll get 5 different levels of resistance bands: X-Light (5-15 lbs. ), Light (10-20 lbs. ), Medium (15-25 lbs. ), Heavy (25-35 lbs.) and X-Heavy (35-45 lbs.). These provide a complete strength training program, all the way from total novices or injury rehabilitation up to advanced athletic users. We've also provided a book of workouts for both PT and fitness. You can try these bands absolutely risk free. If you aren't 100% happy then just return them within 30 days for a full refund - no questions asked. STRENGTHEN YOUR MUSCLES WITHOUT STRAINING YOUR JOINTS: These workout bands put far less pressure on your joints when compared to other exercises. This makes them ideal for injury or surgery rehabilitation. They increase the strength of your muscles without straining your body. WITH FIVE DIFFERENT RESISTANCE LEVELS: You'll get five different bands, ranging from X-Light to X-Heavy. If you're completely new to exercising or you're recovering from injury, you can slowly work up to find the right level for you. If you're an accomplished athlete, you also won't be disappointed. INCLUDES BOTH FITNESS TRAINING AND PHYSICAL THERAPY WORKOUTS: If you've never used resistance bands before, we're there to guide you all the way. Whether you're trying to increase your fitness or recover from injury, you'll find clear, simple instructions for effective workouts inside. 100% MONEY BACK GUARANTEE: Your satisfaction is our top priority. If for any reason you are not fully satisfied with your product within 30 days of your purchase, we will refund your money, no questions asked! Try them today, absolutely risk free. If you have any questions about this product by Opus Fitness, contact us by completing and submitting the form below. If you are looking for a specif part number, please include it with your message.